After the sudden departure of the former Denver Post editorial board editor Chuck Plunkett earlier this year, the opinion section of the Post was without its institutional voice for several months. The Post resumed publication of editorials a few weeks later after new editor Megan Schrader, ex-Colorado Springs Gazette reporter, returned from leave. The first few offerings from the new Denver Post editorial board were not very satisfying, with a particularly insipid defense of Cory Gardner in mid-July that made eyes roll. 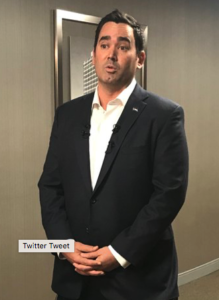 The editorial notes correctly that Walker Stapleton personally raised funds for Better Colorado Now before he formally launched his campaign–which made a farce of the idea of an “independent expenditure committee,” and most certainly makes it fair game to hold Stapleton responsible for the group’s communications now. This was one of the original examples of Stapleton’s fumbling of the most basic principles of a modern campaign–and we expect it won’t be the last time it comes back to haunt him. For all the consternation over the Post’s milquetoast or even mercenary opinions through the years, with the seminal example remaining the paper’s credibility-straining endorsement of Cory Gardner in 2014, we’re glad to see them drawing a bright line against the factually-challenged attacks on immigrants that have become even more routine in the Donald Trump era than they were before. Newspapers no longer have the commanding audience to serve as a binding moral authority, if they ever did. But today’s politics need all the moral checks and balances we can get. More like this please. I'm glad Ms. Schrader decided to call them out on this. Be a journalist Ms. Schrader. Insipid defense of fascist Republicans are best left to insipid idiots like Nutteranus. I know you're right to praise them, it's a good editorial. For the reasons you state and more, the Post is still pretty much dead to me. Praising them for things like this might (just might) encourage more of same. Let's hope. Thanks for checking out The Colorado Independent! Bear with us. We’re in countdown toward launch of our new site. We promise: You’re going to love it.